What schools follow Section 504? Who is helped by Section 504? Section 504 of the Rehabilitation Act of 1973 is a law that protects people with disabilities, including students. It says programs that get federal funds cannot discriminate based on disability. This includes grade schools and high schools. Schools that get federal funds must make sure their students can take part in the same school programs and activities as students without disabilities. Section 504 covers grade schools and high schools. This means kindergarten through 12th grade or K-12. It also covers preschool, college, adult education, and private school. This tip sheet is not about Section 504 in college or preschool. It tells how Section 504 helps students grades K-12 in public and private schools. What does it mean to discriminate or what is discrimination? For Section 504, this means to treat someone with a disability different than someone who does not have a disability. What is a disability? A disability is when a person cannot do a major life activity because of a physical or mental impairment. This definition of disability is the same as used in the Americans with Disabilities Act. All public and private schools follow Section 504 if they receive some sort of direct or indirect federal funding. Examples of funding are school lunch programs, anti-drug programs, and at-risk programs. Section 504 covers all school events. This means sports, music, art, student clubs and more. Section 504 rules for private schools are less strict than for public schools. Private schools also must place students in the “least restrictive environment.” They must give students with disabilities access to the same facilities as students without disabilities. But they do not need to make the full “accommodations” for students that public schools must make, just minor changes. What is the least restrictive environment? 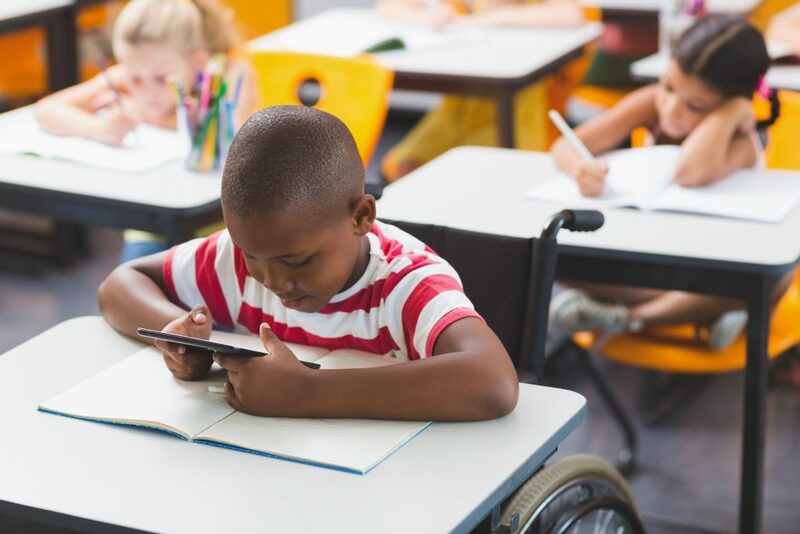 The least restrictive environment means that students with disabilities, including students who get special education services, must be taught in the same classrooms along with students without disabilities as much as possible. What is an accommodation? An accommodation is a change in set up or an aid that helps a student with disabilities attend general education classes with students without disabilities. Section 504 covers the same disabilities as the American with Disabilities Act. A student who can’t do at least one major life activity because of a diagnosed physical or mental disability can get help under Section 504. A major life activity can be moving, talking or working. Reading is also a major life activity. A student with dyslexia might not be able to read. What is dyslexia? Dyslexia is a health issue in the brain that makes it hard for a person to read, write, and spell. They are the right age to go to public school. They are getting education services under state law. They must be given FAPE under the Individuals with Disabilities Education Act. What is FAPE? FAPE is the right of each child with disabilities to a Free Appropriate Public Education. This means schools must give a child special education, if needed, to help the child succeed in school. The school cannot charge the family any money for this help. All federally funded K-12 schools must identify the students with disabilities living in their districts. When a school thinks a student has a disability and may qualify for Section 504 help, the school must evaluate the student. Tell parents about plans to evaluate each student. Obtain the consent of the student’s parents or guardians before doing an evaluation. Decide if the student needs special education services. Decide where the student will go to school. If the parents refuse the evaluation, the school may appeal with a due process hearing. If the parents or guardians tell the school the child has a disability and the school disagrees, the burden is on the parent or guardian to provide evidence of the disability. Parents may appeal the school’s decision with an impartial hearing. What is an evaluation? An evaluation is a process where experts gather facts to decide if a student should get special education and/or accomodations. The process shows what kind and how much help the child needs. Evaluation can mean testing, watching, or talking to people who work with the child. People who know the student’s needs should do the student’s Section 504 evaluation. They join a team to make a 504 plan for the student. Team members may include parents, teachers and other school staff, and Area Education Agency (AEA) staff. The team should look at many things to make the plan. They should review grades over the past several years, teachers’ reports, information from parents or other agencies, state assessment scores or other school tests, observations, discipline reports, attendance records, health records, and adaptive behavior information. The Section 504 Plan should show how the school will meet the student’s needs based on the evaluation. Parents should ask for the 504 Plan in writing. What is Assistive Technology? Assistive Technology (AT) is any tool a student needs to keep up or help the child in school. AT can be low-tech like a pencil grip. It can be high-tech like a computer. AT help can mean help for a student in choosing, getting, or using the tool. A student might need AT tools or help to get a FAPE. The evaluation results tell what these needs are. If a student needs AT to do well in their schoolwork, the school has to give it. This can be: a computer, a screen reader or other software, voice software, or an aid to help the child hear. The Section 504 Plan has to give AT help at no cost to the family. Students should not be moved into a special classroom at first. Schools must prove a routine classroom will not meet the student’s needs. AT is not just for the classroom. The student has to be able to go on field trips, eat in the lunch room, play sports, or join musical groups or other clubs. The student’s AT must let the student take part in any school event. Tell each student’s parents about the school’s duty to give a FAPE. Give names, phone numbers or e-mail addresses for the people in charge of Section 504. Tell parents if their child needs to be evaluated for Section 504, and may need accommodations or services. Let parents examine the information used to make their child’s 504 Plan. Tell parents how to ask to change Section 504 Plans. Tell parents in writing the steps to take if there are problems with Section 504 Plans. Have an impartial hearing where parents or guardians can be represented by a lawyer. They can talk to the person in charge of Section 504. They can complain to the school district. They can go through the Department of Education Office for Civil Rights. They can file a lawsuit against the school. Students covered by Section 504 may sue a school for failing to meet its Section 504 duty. If you think your school is not following Section 504, you should talk to a lawyer. If you have a legal question about assistive technology, or need options for legal help, get in touch with Iowa Compass. Disclaimer: This tip sheet is for information only. This is not legal help. Iowa Compass makes regular updates to give current and accurate information. We cannot be held liable for any outdated or incorrect information.